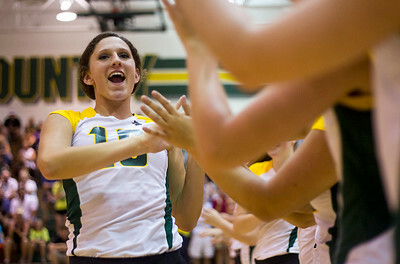 Kyle Grillot - kgrillot@shawmedia.com Crystal Lake South senior Carly Nolan is welcomed to the court by her fellow players before the start of the girls volleyball game against Marian Central Monday, August 24, 2014 in Crystal Lake. 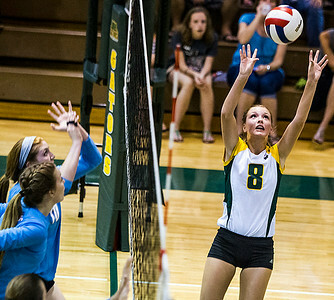 Crystal Lake South beat Marian Central, 25-23, 25- 20. Kyle Grillot - kgrillot@shawmedia.com Crystal Lake South players come together to listen to head coach Jorie Fontana before the start of the girls volleyball game against Marian Central Monday, August 24, 2014 in Crystal Lake. Crystal Lake South beat Marian Central, 25-23, 25- 20. Kyle Grillot - kgrillot@shawmedia.com Marian Central sophomore McKayla Wuensch sets up an assist during the girls volleyball game against Crystal Lake South Monday, August 24, 2014 in Crystal Lake. Crystal Lake South beat Marian Central, 25-23, 25- 20. 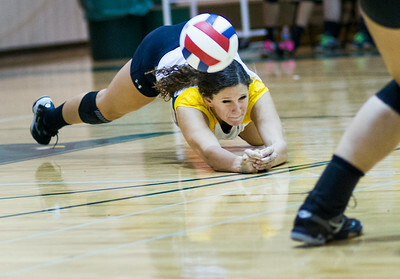 Kyle Grillot - kgrillot@shawmedia.com Crystal Lake South senior Abigail Marchewka goes to pass the ball during the girls volleyball game against Marian Central Monday, August 24, 2014 in Crystal Lake. Crystal Lake South beat Marian Central, 25-23, 25- 20. 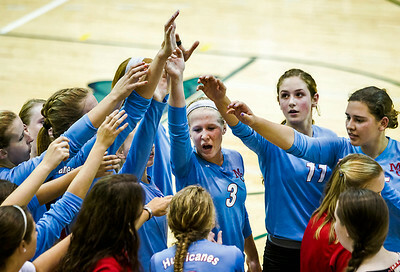 Kyle Grillot - kgrillot@shawmedia.com Marian Central sophomore McKayla Wuensch (3) leads her team in a cheer before resuming play during the girls volleyball game against Crystal Lake South Monday, August 24, 2014 in Crystal Lake. Crystal Lake South beat Marian Central, 25-23, 25- 20. 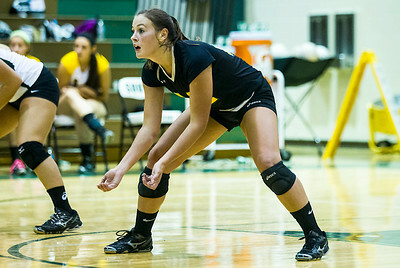 Kyle Grillot - kgrillot@shawmedia.com Crystal Lake South senior Cassy Sivesind goes for an assist during the girls volleyball game against Marian Central Monday, August 24, 2014 in Crystal Lake. Crystal Lake South beat Marian Central, 25-23, 25- 20. 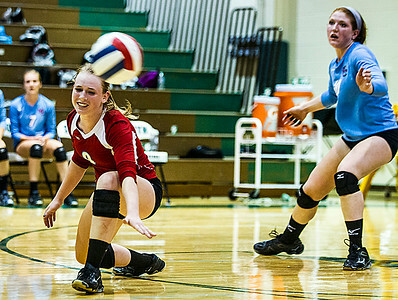 Kyle Grillot - kgrillot@shawmedia.com Marian Central junior Alex Kaufmann (left) is unable to get to the ball as junior Rachel Guistino watches during the girls volleyball game against Crystal Lake South Monday, August 24, 2014 in Crystal Lake. Crystal Lake South beat Marian Central, 25-23, 25- 20. 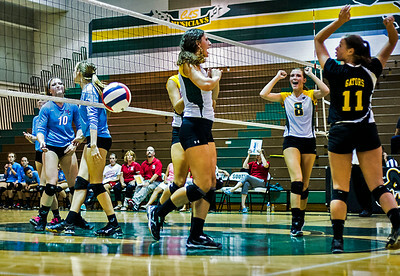 Kyle Grillot - kgrillot@shawmedia.com The Crystal Lake South team celebrates after a scored point during the girls volleyball game against Marian Central Monday, August 24, 2014 in Crystal Lake. Crystal Lake South beat Marian Central, 25-23, 25- 20. 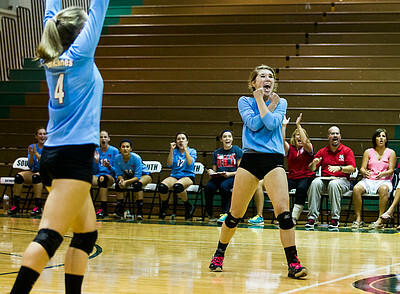 Kyle Grillot - kgrillot@shawmedia.com Marian Central senior Sarah Hendle (right) celebrates a scored point during the girls volleyball game against Crystal Lake South Monday, August 24, 2014 in Crystal Lake. Crystal Lake South beat Marian Central, 25-23, 25- 20. 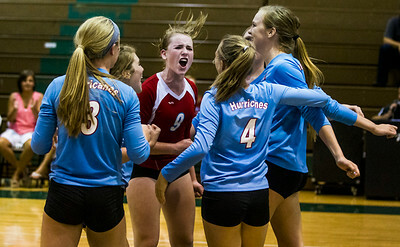 Kyle Grillot - kgrillot@shawmedia.com Marian Central junior Alex Kaufmann (center) celebrates a scored point during the girls volleyball game against Crystal Lake South Monday, August 24, 2014 in Crystal Lake. Crystal Lake South beat Marian Central, 25-23, 25- 20. 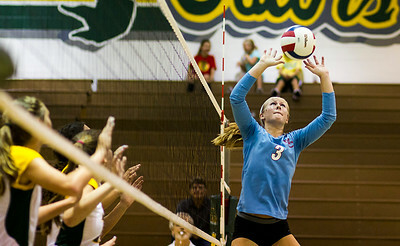 Kyle Grillot - kgrillot@shawmedia.com Crystal Lake South senior Victoria Falbo goes to pass the ball during the girls volleyball game against Marian Central Monday, August 24, 2014 in Crystal Lake. Crystal Lake South beat Marian Central, 25-23, 25- 20. 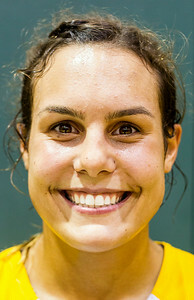 Kyle Grillot - kgrillot@shawmedia.com Crystal Lake South senior Abigail Marchewka after the girls volleyball game against Marian Central Monday, August 24, 2014 in Crystal Lake. Crystal Lake South beat Marian Central, 25-23, 25- 20. 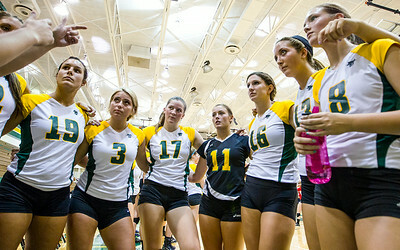 Crystal Lake South players come together to listen to head coach Jorie Fontana before the start of the girls volleyball game against Marian Central Monday, August 24, 2014 in Crystal Lake. Crystal Lake South beat Marian Central, 25-23, 25- 20.